Fondly remembered by many a child of the 1950s and 60s as the 'big white ships', Canadian Pacific's final generation Empress liners were undoubtedly among the most distinctive and finest looking post-war passenger ships built in Britain. Empress of Britain was launched by HM The Queen from the Fairfield Shipyard, Glasgow, in June 1955. The 640-foot (197 m) 25,516 grt liner entered service on the UK - Canada transatlantic routes the following year. Joined by her Tyne-built sisters, Empress of England in 1957 and Empress of Canada in 1961, this handsome trio provided a reliable and regular service from Liverpool and Greenock to Quebec and Montreal. Although sold by Canadian Pacific in 1964 due to the ever growing popularity of jet air travel, Empress of Britain was still operating in 2001 as a cruise liner (Topaz), as indeed was her younger sister, Empress of Canada. 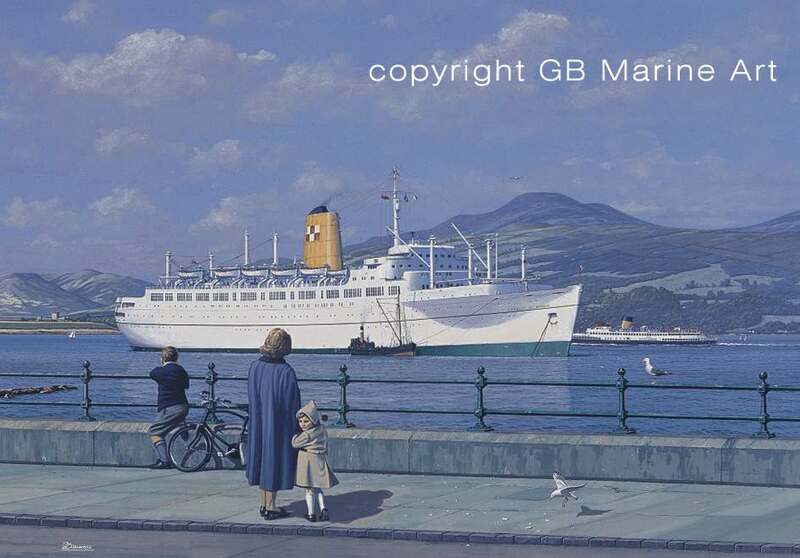 This nostalgic and highly detailed painting by Gordon Bauwens shows the liner anchored off Greenock in 1960. 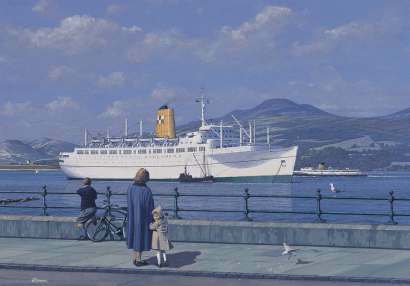 The family of a serving officer watch from the Esplanade as the liner, attended by a Clyde puffer, prepares for her imminent transatlantic departure. The turbine steamer Queen Mary II on a day-cruise 'doon the watter' from Glasgow, sweeps down the main channel behind. These superb quality 'Memories of an Empress' Artist-signed limited edition prints are carefully produced using fade-resistant inks on heavy, acid-free art paper. Each has its numbered Certificate of Authenticity, printed on attractive marbled parchment paper. From an original painting by Gordon Bauwens. Limited edition of 450 individually signed and numbered fine art prints.